Pest description and damage The adult locust borer is a conspicuous and brightly colored beetle. Its jet-black body is encircled in yellow bands, with a distinctive W-shaped band extending across the wing covers. The adult is about 0.75 inch long with reddish legs and black antennae. Locust borer larvae are white and legless, reaching a maximum length of about 1 inch. Locust borer larvae weaken trees, rendering them susceptible to wind breakage and retarding growth. Severe infestations of locust borer result in many dead and broken limbs, along with swollen areas on the tree trunks. Biology and life history Mature adult beetles emerge through the holes of host trees. They lay eggs under the tree bark scales and around wounds. Eggs hatch in a week and the larvae prepare a hibernaculum in which they spend winter. 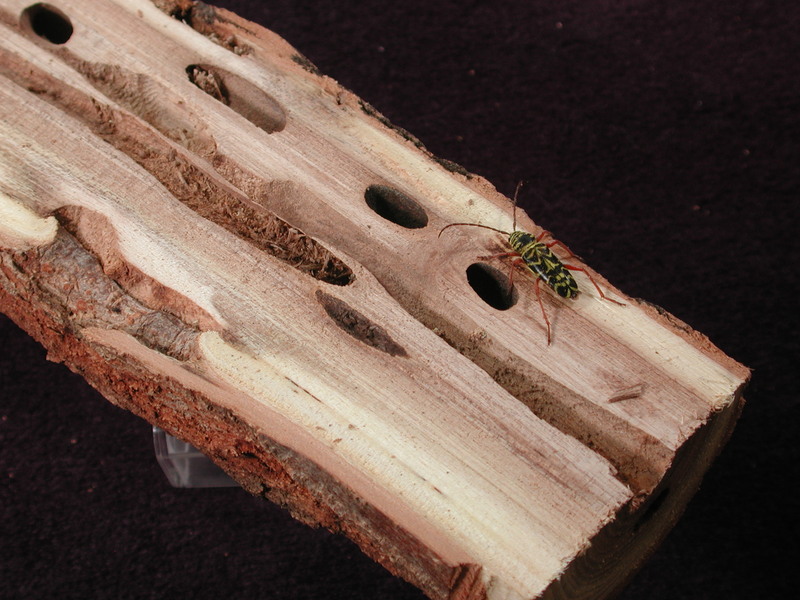 In the spring, larvae bore into the woody parts of trees, frequently penetrating the heartwood. Throughout the spring and summer, larvae enlarge their feeding tunnels to 3 to 4 inches long and about 0.25 inch diameter. Tunnels initially are formed in an upward and inward direction from the point of entrance, then angle sharply straight down the trunk, resulting in an L-shaped tunnel. Pest monitoring Look for branch breakage during winds or branches with knotty swellings. In spring when buds swell, look for wet bark and sap flow as larvae tunnel under the bark. By midsummer, white sawdust-like frass is pushed out through holes in the bark as the larvae tunnel in the sapwood, and later, as they bore into the heartwood, the frass is a yellow sawdust. Sawdust frass may accumulate at the base of infested trees. Keep trees vigorous. Remove infested trees that harbor the larvae. Water-stressed trees also may be highly susceptible to attack; thus, watering trees during times of drought may increase their resistance. This is an introduced species; no information on biocontrol is listed but birds and parasitoids are likely possibilities. Galford, J.R. 1997. The locust borer. USDA-FS Leaflet 71. http://na.fs.fed.us/spfo/pubs/fidls/locust/locust.htm.